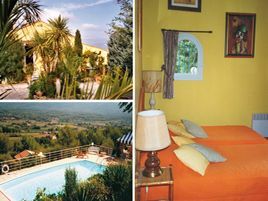 Large flower-filled grounds and wonderful views for these self-contained rooms with private terrace and decor in the colours of Provence. Books and music at guests' disposal. Friendly welcome..
- Golf de Frégate Bandol à 10 km. 3 rooms with shower and WC. 85 euros (1 or 2 pers.). Extra bed 20 euros. The closest station is Bandol, located at 8 km. The closest airport is Hyères, to 40 km.